Whenever I get a hotel invite that involves the word “Westin”, I get pretty excited. I love to travel but also love my comfortable bed at home. Luckily, my bed is a Westin Heavenly bed complete with Westin Sheets and I hate to admit but matching Heavenly dog bed. So whenever we stay at a Westin, we get a little piece of home. 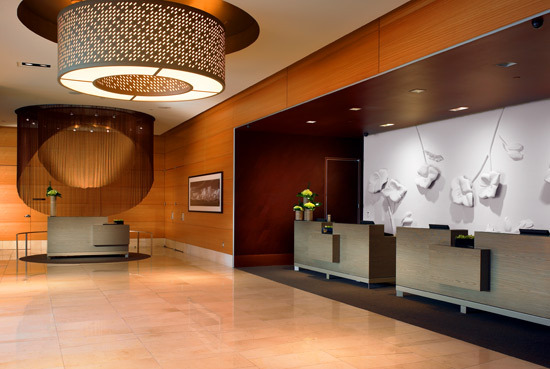 We gladly accepted an invitation to check out the Westin Galleria Dallas. Having never been to Dallas myself, I was excited when my friend R We There Yet Mom? told me how much she loved the hotel. She had a successful girls weekend there but I was left wondering if it would be as great for a traveling family. Turns out is was. 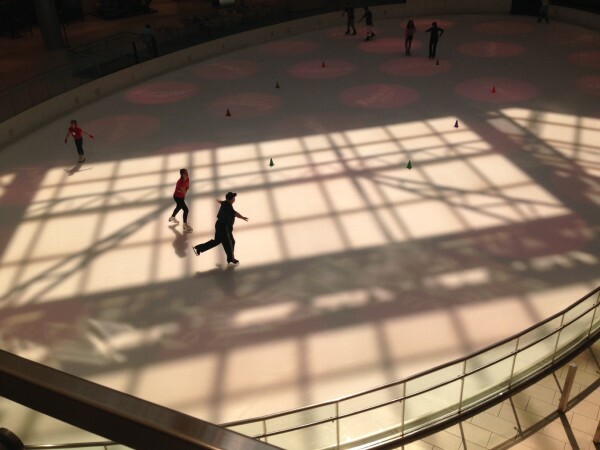 Here are my 5 top reasons to take your kids for a getaway to the Westin Galleria Dallas. I’m a big fan of good customer service and I expect a lot when I stay at a Westin. This is due to the service and treatment I have received both pre and post kids at Westin Hotels. From the time we pulled into the driveway until the time we left, I was blown away by the customer service we received. The check-in staff, lounge staff and everyone else were definitely what I expect at a Westin and the kids and I felt so at home, we lingered in the lobby for about an hour before leaving. The greatest example of customer service I witnessed actually had nothing to do with us. A small boy about the age of 10 had somehow gotten separated from his family and was very upset. The concierge and a front desk staff immediately helped him, got him calmed down and reunited him with his mother. The care and empathy they showed was exactly what any mother would want her child to experience. I wish I had gotten their names to give a specific shoot-out as I truly couldn’t believe how professional and caring they were at the same time. Although we spend our lives travel, a big part of it for me is working with hotels which means I have to work every night to keep up while traveling. Having a space to work that isn’t just the room gives the kids and I a break at night. We arrived in Dallas quite late after spending one last morning lounging at the Hyatt Lost Pines and to say the least, we were all exhausted when we arrived. I often try and stay in hotels with an executive lounge whether or not it is a blog trip for this simple reason- its like having a fully stocked kitchen. I dreaded going to another restaurant. We headed upstairs and were assisted by a very kind woman who helped me make sandwiches, got us settled (on my request) far from the other people who were working or relaxing, and even arranged for some surprises for the kids. 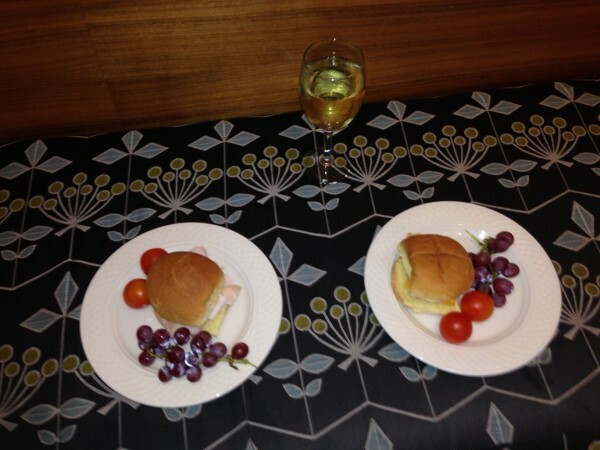 I enjoyed a glass of wine while we all had custom made sandwiches and fresh fruit. The added expense for access to lounges like this is usually offset by the amount of food and drink you can consume as well as the free internet and we took advantage of all of it. I woke up the next morning with two sniffly sick kids and called up the lounge for help. They packed up boxes of breakfast for us all as well as fresh orange juice. Road trip lesson number #1: You do not want to stay anywhere in Texas in summer without a pool. Dallas was no exception. The days were hot and the nights were nice enough to be outside playing in the pool. I loved the furniture setup outside the Westin Galleria pool. Instead of roped off cabanas we have seen in other hotels, you are welcome to sit in lovely family spaces that are first come first serve. The pool is also equipped with tons of swim toys, floaties, and life jackets which helped a lot as we had just lost ours. The kids splashed and played having a great time while I was able to work while lounging next to them. I am not one for malls especially with kids. That being said, if you are going to be attached to a mall on your vacation, it should be this one. The kids and I loved the giant skating rink that was feet from the entrance of our hotel and were blown away by the concept of skating in relative warmth. The quality of the stores is also impressive. From my go-to Lululemon Athletica to the many cute Texas stores where we picked up some neat souvenirs, you will find something you love here. When staying at the Westin Galleria you also get a VIP guest card to use in the mall with discounts and offers especially made for people traveling in from more than 50 miles away. We more than qualified. I almost fainted when we drove into the hotel and I saw the American Girl store right next to it. How had my fellow travel blogger and very good friend Rebecca not brought this up before I pulled in with a 4 year old girl? Luckily the kids were so excited to check-in that they didn’t even see it. This left me with a big decision. We love American Girl but there definitely was not a second American Girl doll in this summer’s budget. I hemmed and hawed and tweeted about what to do and finally decided there was no way we were leaving Dallas without checking out the American Girl Boutique in Dallas. Will and I worked together to weave Charlie through the whole mall promising her a surprise. You need to exit the mall to enter American Girl making the surprise even better. To say the least Charlie was pretty excited when she saw it. We toured the boutique and made our way up to the café. Will was very understanding about this special trip for Charlie but was pretty taken with the store too. He played with a lot of the doll cars and accessories and enjoyed his time there. Particularly when I announced we could have a sweet ice cream treat. Charlie had a classic sundae while I let Will order a banana split. They were both huge and delicious and in the end we had a great morning at the store. 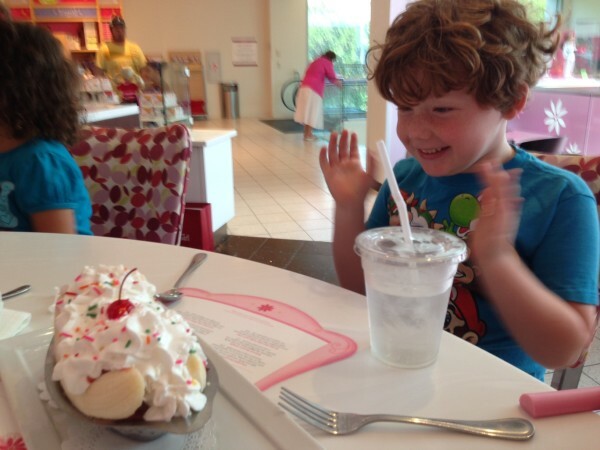 Amazingly, we left American Girl with three cute hair bows, stomachs full of ice cream and having only spent $13. The hair bows are a gift for everyone who eats at the cafe. I’ve been wearing mine ever since. 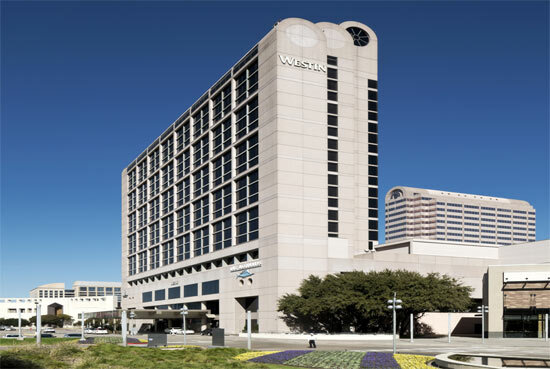 The Westin Galleria Dallas is a great place to spend a night and day with kids. We could easily have spent a weekend on the property enjoying the hotel pool and amenities and exploring the mall and surrounding area. You’l be exhausted by the time you get to bed but don’t worry I can guarantee that the heavenly beds are comfortable enough that you may just end up buying one too. We stayed at a Westin this past weekend – last minute somewhat local staycation. We payed the extra for club level and it was well worth it.